At last summer's San Diego Comic-Con, the halls were abuzz with the news that Jeffrey Dean Morgan was going to play Batman in the Flashpoint movie. However, a lot has changed since then and there have been a lot of big shakeup's behind-the-scenes at Warner Bros. and DC Films. Now, it looks like the Flashpoint movie will end up as a Flash origin story instead and Morgan believes that his chance of playing Batman could be finished due to Zack Snyder's exit from DC. 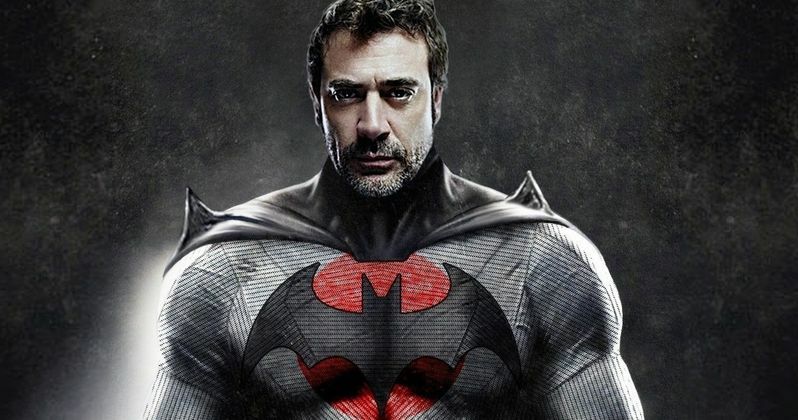 Flashpoint was announced last year at Comic-Con and while it was never officially revealed that Jeffrey Dean Morgan was going to reprise his role as Thomas Wayne in the film, the actor sure made it seem like it was a done deal, much to the delight of Batman fans all over. The idea of the twisted Flashpoint story was already cool enough, but introducing another version of the Caped Crusader from another timeline was and is a pretty awesome idea, especially with Morgan in the role. In a recent interview, Jeffrey Dean Morgan cast doubt on his version of Batman ever hitting the big screen. He says that he doesn't know if the movie will happen, but admits that he likes talking about it because it keeps the idea alive and adds that it's also fun. In the end, it looks like Zack Snyder not being involved anymore is likely the reason that the Flashpoint movie won't happen. Morgan explains. "I'll keep talking about it because it's really fun to talk about and I really would like Warner Bros to open their ears a little bit. When Zack Snyder was involved in the DC world more, I think there was a real possibility. But now that he's kind of stepped away a little bit, I've heard different things that Flashpoint might not be going in that direction. It'll be more of an origin story for Flash. But look, I'm always here and would love to do it." Always optimistic, Jeffrey Dean Morgan says that he's still down to play the part of Thomas Wayne again, which is cool, but just not all that realistic at this time. Zack Snyder was the driving force behind the DCEU, but Justice League seemed to be the last straw. It's hard to think back to now, but Snyder's pre-Justice League work was torn apart by critics and DC fans, with many indicating that the movies were too dark. However, after he left the project, fans came out of the woodwork to demand that Snyder's cut get a proper release, which is still getting talked about today. Flashpoint could still happen at some point, but there wasn't even a mention of a Flash movie at all during this year's Comic-Con. Warner Bros. and DC Films focused on Aquaman, Wonder Woman 1984, and Shazam!, which isn't a bad thing at all, it just brings up some serious questions about the many other projects that are currently in various stages of development. Hopefully, we'll get to see Jeffrey Dean Morgan as Batman one day, but it doesn't look like that day will be coming any time soon. You can watch the rest of the interview with Morgan below, provided by the MTV YouTube channel.